(Lancaster, Pa., May 23, 2018) - The San Francisco Giants have purchased the contract of right-handed starting pitcher Brooks Hall, it was announced today. Hall, 27, is the first Barnstormer to leave for a Major League organization in 2018. The right-hander made four appearances for the Barnstormers, including three starts and one game in which he relieved Nate Reed in the first inning following a nearly two-hour long rain delay. Hall was 2-1 with a 3.00 ERA in those appearances. Over 21 innings of work, the native of Anderson, SC allowed 19 hits and seven earned runs. He walked four and struck out 21. Prior to coming to Lancaster, Hall pitched for seven seasons in the Milwaukee organization and one with the Arizona Diamondbacks. He reached Class AAA in both the 2016 and 2017 seasons. Last season, the Giants purchased the contracts of four members of the Lancaster squad out of the 11 total from the Barnstormers. 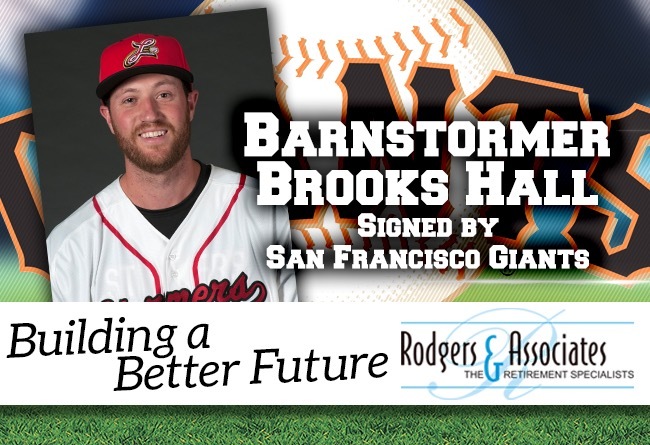 Current Barnstormer Matt Reynolds’ contract was purchased by San Francisco in 2016. Reynolds advanced to the Majors Leagues by the end of the season. Hall has not formally been assigned to a club.